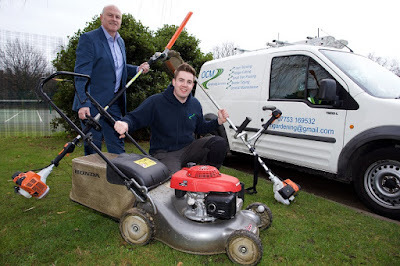 A green-fingered Rotherham-based entrepreneur has launched his own garden maintenance business after a funding boost of £500 allowed him to purchase vital equipment and marketing material. The helping hand, which came from the UK Steel Enterprise (UKSE) Kickstart fund, allowed to purchase much needed equipment including a hedge trimmer, as well as advertising to help raise awareness of the brand. Now, OCM Gardening is working on behalf of customers across the region – providing services such as garden clearance and ongoing maintenance. Joseph Outram, founder of OCM Gardening, said: "I established the business last summer and received a handful of word-of-mouth enquiries, but I was really able to take things to the next level thanks to the funding boost from the UK Steel Enterprise Kickstart fund. "Not only has the advertising allowed me to raise awareness of the business to a wider audience – which has resulted in a lot more business – but I was able to buy new equipment that made the whole process a lot more efficient." Joseph is now on track to build the business further and will be looking to take on an apprentice and get a larger van, both to accommodate taking on larger jobs and increasing workload in the near future. Launched in February 2016 by UKSE, with support from RIDO and Rotherham Youth Enterprise (RYE), the Kickstart Fund consists of a £40,000 pot dedicated to supporting people looking to establish a business in the area. UK Steel Enterprise, a subsidiary of Tata Steel, was launched in 1975 to support the economic development of steel industry areas. Allan Wood of UK Steel Enterprise said: "It is great to be able to help Joseph launch his own business and it is clear that he is already looking to the future and considering how to take things to the next level."